The op-ed is a message to the French public that this emerging technology will be an agent of change — both disruptive and beneficial. 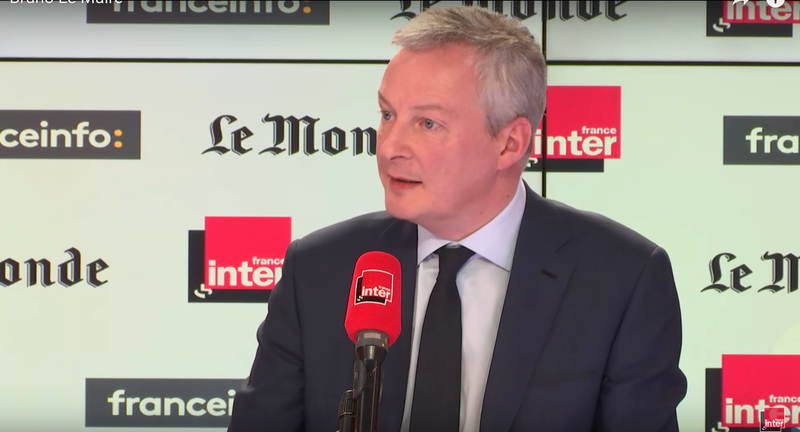 According to Le Maire, blockchain technology and cryptocurrencies “could upset daily practices in the banking and insurance sectors, financial markets, but also patents and certified acts.” He goes on to warn what has been echoed by leaders of other nations, that there should be anticipated consequences for traditional players. “Let’s not be mere spectators: become actors in this revolution,” he urged. Le Maire goes on to state that France’s policy should be benevolent yet cautious. He expressed weariness for the chaotic nature of decentralization by questioning speculative products, investor security and the ever-present possibility that the technology could be used to launder or fund criminal activities. “Clarifying the law to attract innovation, identify risks without hindering our ecosystem, that’s our approach,” wrote Le Maire. He goes on to advocate for a former French central bank governor, Jean-Pierre Landau, who has been assigned to further investigate cryptocurrencies to formulate a proposal for a more navigable regulatory framework. The sentiment is repeated in some way by several other commentators; the point being, that a publication as critical of centralized authority as Numerama publishing a public message about cryptocurrency adoption by the central government gives an overly optimistic, if not artificial and incomplete, view of government policy. The other reason why the op-ed comes across as ineffectual is its vague optimism toward less cryptocurrency regulation. Based on what has happened earlier this year in France and other nations, Le Maire’s cryptocurrency policy, and by association the French government’s, has tended to lean hard toward heavier regulation. For instance, Jean-Pierre Landau — the central banker for whom Le Maire advocates in the op-ed and has entrusted to build a regulatory framework for cryptocurrency — is a notable Bitcoin skeptic who denounced the cryptocurrency back in 2014 in his own op-ed for the Financial Times. Landau’s argument is that currencies need central banks to be successful so that adjustments to the monetary supply can be made; therefore, bitcoin’s scarcity (small supply) will be insufficient to satisfy demand and, as a result, the economy as a whole. While it might not be clear what Landau thinks four years later, Le Maire appointed Landau to lead a working group for the purpose of regulating cryptocurrencies back in the middle of January 2018. Shortly after Le Maire’s op-ed, world leaders met in Argentina for the G20 Summit and, specifically, the greatest event for cryptocurrency regulation so far in 2018. Despite the changing views of Mike Carney, governor of the Bank of England and chairman of the Financial Stability Board (FSB), who has eased up on cryptocurrencies, France has advocated for a regulatory framework for cryptocurrencies that they are now pursuing with Germany. This cooperation is evidence that the call from German central banks for effective regulation of virtual currencies on a international scale is an opinion shared by many French authorities. These developments, no doubt, are linked to an increased regulatory focus on cryptocurrencies in other countries such as China, South Korea and the U.S. Future cryptocurrency regulation will almost certainly require international cooperation for it to move forward ,given these recent developments and the cross-border attributes of cryptocurrency in general. The G20 ultimately determined that cryptocurrencies should be regulated as property for now, though it is likely they will be regulated as their own unique asset class as time moves on. World leaders also left the G20 with an agreed upon notion to have effective regulations in place by July 2018. If France has recently decided to cultivate a suitable environment for cryptocurrency, credit is due in large part to Laure de La Raudière. Raudière is a republican who represents the Eure-et-Loir department in the National Assembly of France (lower house of the bicameral parliament of France). She was also appointed in early February to lead the National Assembly’s “Mission d’information.” The purpose of the mission has been to investigate blockchain technology in France and abroad to produce reports that will inform legislators on topics related to how the technology can be used and should be regulated. The mission is expected to take no more than six to seven months since February, meaning it should be wrapping up around the time the G20 world leaders will reconvene for regulation consensus. Though French authorities appear determined not to let the technological innovation of cryptocurrencies and blockchain technology to pass them by, time will tell where they will inevitably fit on the global regulation spectrum. L’Autorité des Marchés Financiers (AMF) has also gone after specific cryptocurrency players who are not registered with the AMF. To avoid mis-legislating, you have to understand. I have always enrolled in this approach of technology education, focusing on highlighting the repercussions of the prohibition of a technology. For example, at the time of the HADOPI debate, amendments aimed at banning peer-to-peer technology; it revealed a total misunderstanding that technology can be used to achieve illegal things but also to accomplish extremely positive things.Most of the time, it’s not the technology you have to ban, but the way it’s used.